Download this programming book today! 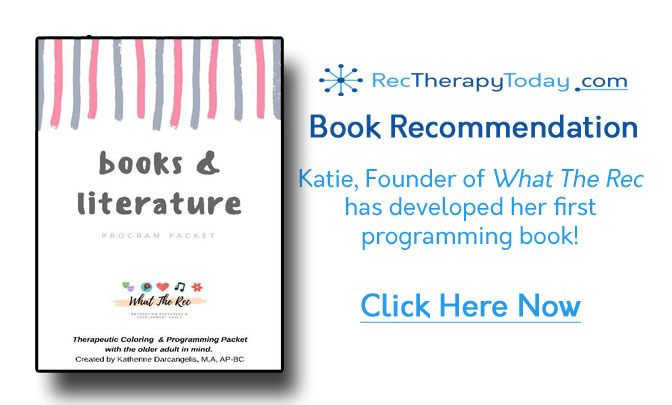 My good friend, Katie, Founder of What The Rec has developed her first programming book! Congratulations Katie! Way to go! You’re such an inspiration to me and others. This 25-page PDF download has a theme throughout centered around books and literature. Danny’s comments: most people know that I have Bibliophilia (a love of books). What The Rec aims to release more themed programming books to ensure professionals are creating fulfilling, enhancing programs for our clients and residents, without the hassle for you! One downloadable packet is only $10 and can be printed and used again and again and again. This download has already reached professionals across The United States, Canada and Australia! Order a copy of this book now! Click here to order this book — just add $10 (or more) and you’ll get a copy in your email! “Katie (at What The Rec) has done the difficult part in creating meaningful programs! You can get access to her amazing resource to make your programming a bit easier. Each of the pages in her book are carefully created to showcase a range of pages about books, authors, and literature. This download is a steal of a deal.— Danny Pettry, Founder of Rec Therapy Today.